We were delighted to welcome a delegation from the city of Changsha in China, earlier this week. Changsha is an interesting city and one that, size and scale aside, has more in common with our home town of York than first meets the eye. Despite the vast difference in population (Changsha 7.64 million; York, just over 200,000) and the contrasting skylines, both have a significant historic and cultural heritage. For over a thousand years, Changsha exported vast amounts of exquisite porcelains and magnificent fireworks to the rest of the world but today, like York, the city is looking at a future in creative digital technologies and media arts. 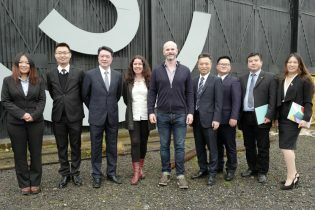 York’s successful bid to become a UNESCO city of Media Arts back in 2014 drew the interest of Changsha and provided the rationale behind the delegation’s visit. It was an honour to show them round our facilities and a delight to receive such an enthusiastic and positive response. We look forward to the possibility of collaboration in the future and wish the city of Changsha the best of luck in joining York, the French cities Lyon and Enghien-les-Bains, as well as the Japanese city of Sapporo, in their bid to become a UNESCO City of Media Arts. The last year has seen increasing levels of interest in our business from markets in Central Europe and East Asia. With major sporting and cultural events coming up in both Japan and South Korea, we hope to further expand our reach in both regions.